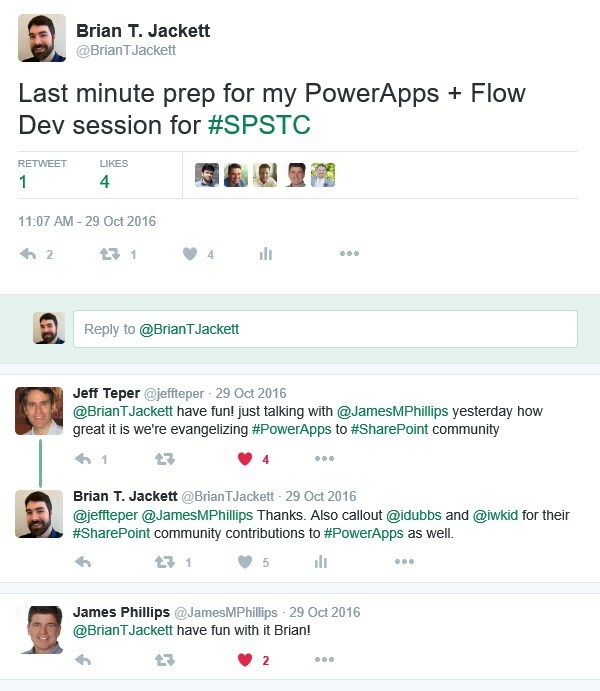 I wrote a guest blog post Introducing Brian T Jackett: PowerApps and Microsoft Flow Social Media Sample for the official PowerApps blog. I also provided the social media sample demo code along with a video walkthrough of the demo. Special thanks to Pratap Ladhani and Audrie Gordon for getting this published. Please read and leave any feedback or questions in the comments on that post. Over the past 6 months I’ve given a number of external and internal presentations on PowerApps and Flow for developers. One of the highlights of this presentation was an interactive demo integrating a variety of cloud services such as Twitter, Azure SQL, Azure Web App, Azure API App, Microsoft Flow, PowerApps, and Custom APIs. Attendees were able to use a hashtag on Twitter that then fed into the demo and we would track the data through multiple platforms to present the data back out. After giving this presentation internally Pratap Ladhani (Principal Program Manager for PowerApps and Flow teams) asked me to share out this demo. This guest blog post is the result of that. A big thank you out to the organizers, attendees, and sponsors from SharePoint Saturday Twin Cities. It has been a number of years since I was last at this event and great to see it alive and well. I had a great time getting to talk with attendees and fellow speakers as well as presenting two sessions. Slides, code, and scripts from my sessions are below. If you have any feedback or follow up questions please leave a comment below. On a personal note I was completely flattered when Jeff Teper (“father of SharePoint” himself) and James Phillips (CVP for Business Apps at Microsoft) tweeted back to me during my prep time this morning. Great to see the Corporate Vice President or SharePoint and OneDrive engaged and supporting community events. A sign of good things to come from the SharePoint and PowerApps leadership.